The state's largest utility said the restoration has been hampered by extensive tree and infrastructure damage. After a one-two punch of heavy, wet snow this week from a nor’easter and lingering system, some Vermonters may not have electricity until the weekend. Green Mountain Power and Gov. 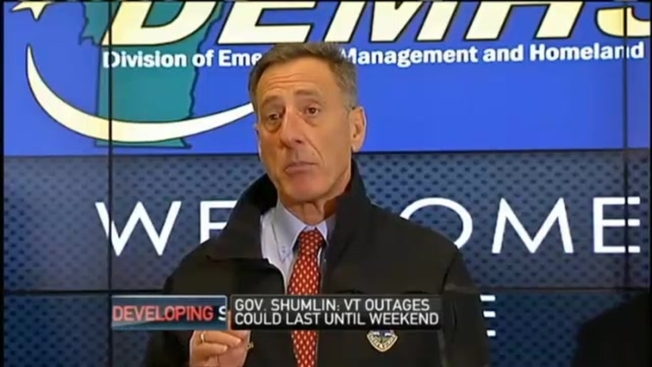 Peter Shumlin, D-Vt., said the weight of the snow caused damage statewide, which has hampered power restoration efforts. Snowfall totals varied greatly, from a few inches to about 20. Many communities saw about a foot of snow, according to data compiled by the National Weather Service's office in Burlington. Green Mountain Power said Thursday around 100,000 of its customers lost service for at least a short while this week, while others have been out for much longer. "Some have been without power since Tuesday, and we anticipate they may be without power going into the weekend," Gov. Shumlin said at a news conference Thursday at the Vermont Emergency Operations Center in Waterbury. While utilities have made progress in restorations, by midday Thursday, more than 30,000 customers were still without power across Vermont. The most outages were reported in Addison, Rutland, and Chittenden Counties, according to VTOutages.com. One of the biggest challenges for utilities, Green Mountain Power said, has been that new outages have kept coming. Mashed potato-like snow was sticking in the trees and pulling down limbs, often in hard-to-reach areas. GMP CEO Mary Powell said the falling tree limbs have caused extensive damage to the power infrastructure, and indicated she expects this storm recovery will cost several million dollars. "We were not anticipating this type of weather event," Powell said. Powell told reporters more crews are now working on power restoration than during the aftermath of Tropical Storm Irene. She said the army attacking outages includes more than 550 line workers total. Extra help has been brought in from contractors and utilities from New Hampshire, Maine, and Massachusetts, including from NStar, Western Massachusetts Electric Company, and Central Maine Power Company. "They're very, very labor-intensive ones to fix when it's tree related," Powell said of winter power outages. "And it's all over the state." Mark Maloney, a Green Mountain Power lineman who was knocking snow off branches and lines in Waterbury to prevent losing electricity once it comes back on, said he is holding up okay, despite the tough work. "We went and got a few hours of sleep last night, so it's going good today," he told New England Cable News. Tim Russell of Waterbury Center praised the line crews, tree trimmers, transportation workers and others helping the state clean up. "It goes to show how dedicated they are," Russell said. "We appreciate it. It was a nasty storm." Gov. Shumlin asked Vermonters to check on their neighbors, to make sure they're warm enough and have food, with all those stubborn outages still out there to fix. The Vermont Division of Emergency Management and Homeland Security encouraged Vermonters to sign up for the service known as VT-Alert. It provides messages via voice call, text, and email regarding severe weather, traffic conditions, public health concerns and other alerts which users can customize based on their location and preferences.